Dont Get Crushed is a simple game in which you must move left and right to avoid being crushed by balls that bounce across the screen. The longer you survive the faster the game moves and the higher your score will be. 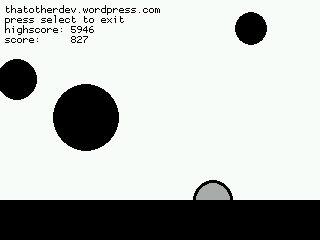 Its a clone of the iPhone game Falling Balls which I've admittedly never actually played. Very simple game; reminds me something you'd get on a really old mobile phone. Quite nice music, though. Can be fun for a few minutes.